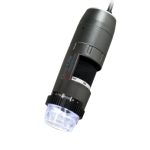 The Dino-Lite AM4115ZTF Edge Series "Far" working distance polarizing model is designed to provide extra-long working distance with a magnification range of 1x - 70x. At 10x with 19" working distance and 70" at 4.25". The 1.3MP AM4115ZTF impressively offers minimum 115mm viewing distance with maximum 70x magnification. In comparison to the Edge Series long working distance models, the AM4115ZTF extends 80mm working distance at 70x magnification, making it an ideal option for fabrication or observation requiring long distance. The built on polarizer helps reduce or eliminate glare on reflective surfaces providing a clearer view and high quality image.